The illustrated Smith's Sharpener is the Smith's Diamond and Arkansas Stone Combination Sharpener that features a Natural Arkansas Sharpening Stone; an approximately 1,000 to 1,200 grit stone that sharpens and polishes the cutting edge simultaneously. 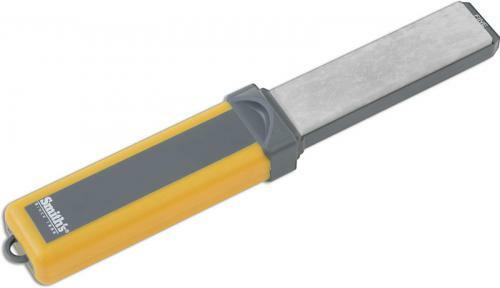 The yellow and gray handle provides storage for a coarse 325 grit diamond sharpening stone with interrupted surface, straight line groove for sharpening hooks and pointed objects, and Micro-Tool Sharpening Pad™ for blade tips and small cutting tools. The Smith's Diamond and Arkansas Stone Combination Sharpener has 4" by 1" sharpening surfaces and a hanging hole for storage.